The Pops Benefit Dance held on September 16 was a great success. 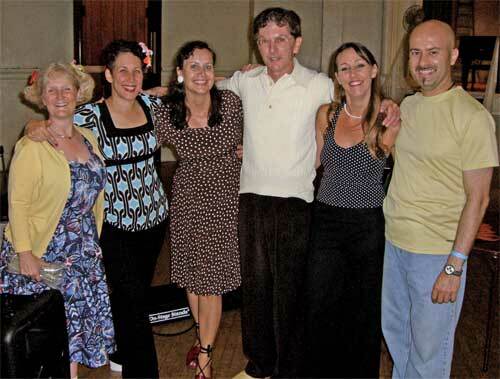 POPS' BENEFIT DANCE BRINGS IN OVER $7,000! 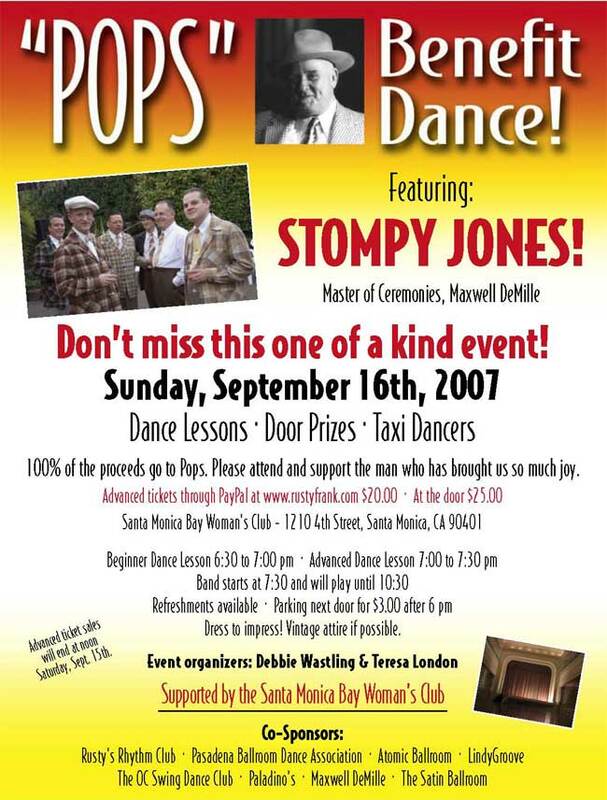 I know that everyone who attended Pops' Benefit Dance last Sunday is still flying high from this terrific event. The music was great (Stompy Jones), the atmosphere was simply sensational. There's just something quite special when people gather as a community to help someone in need -- and that's what it was all about. Thanks to everyone who helped by volunteering and donating. One of the evening's highlights for me was when we called Pops from my cell phone. I put him on speaker phone and everyone shouted "We Love You Pops." Honestly, it was like a powerful wave of love! I ran out to the parking lot to tell him about the event, and he was crying from the emotion of it all. You all are just great. I would like to thank all of you for supporting the Pops Benefit. Without you, it would not have been such a great success! We raised a total of $7,310.36 for Pops!!!!! I spoke to Pops today to tell him how much we raised, and he was very pleased. He said to say "thank you" to all of you who had supported the event and made donations for him. He had sent me an e-mail after I first contacted him about the event that said "I don't know why I live in San Francisco when all of my peeps live in LA." So, thanks to all the "Peeps!" Hats off to Stompy Jones for entertaining us all evening with their wonderful music. For those of you that don't know, they gave up a Sunday to help make this event a special one. A special thanks to Monika and the Santa Monica Bay Women's Club for allowing us to hold the event at their beautiful location for free. Monika has worked hard on this event from sending out press releases to helping us prepare the rooms. She also helped promote the event through The Satin Ballroom e-mail list. Rusty Frank couldn't have been more helpful or supportive of this event. She coordinated advanced ticket sales through her website (on her "Pops Pages, and she announced the event every chance she had at classes and the Wednesday night venue "Rusty's Rhythm Club." I would also like to thank Kia for helping us attain the venue location, promoting the event through LindyGroove, Third Street Swingers, and PBDA, plus he also helped with the set up and cleaning of the building. Maxwell DeMille for being our MC. Robert "The Professor" Vangor as the DJ. He took extra special care in setting up his speakers so that it would sound awesome, and it did! Dave and Kim and Steve and Heidi as dance instructors. Doug Silton, Dave and Kim, and Rusty for door prizes. Ken Horowitz for raising $375 on the 50/50 raffle. AND thank you to the woman that won that raffle and gave her entire half back to Pops! I'm sorry I don't have the woman's name, but she's great! Or as Maxwell would say "Isn't she swell!?" Hollywood Hornet Taxi Dancers - Sharlene Choy, Tunde Hrotko, Jenny Kim, Mae-Lae Louie, Quinn Nguyen, Tim O'Neill and Giovanni Quintero. The Hollywood Hornets raised $300! The girls were having way too much fun. They had men donating up to $20 per dance! Way to go ladies! And maybe you saw Tim promoting himself with a hand made sign that had a big "$1" written on it? Too funny. Elaine Dee for set up and clean up. John Apodaca, Agnes, & Jon Moody for clean up, and Scott Giordano for helping promote at Atomic Ballroom. And let's not forget all of the venues that helped promote this event. 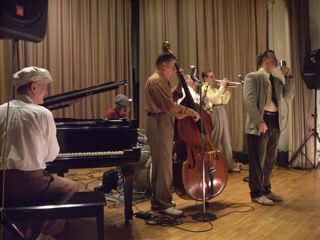 Rusty's Rhythm Club, Pasadena Ballroom Dance Association, Atomic Ballroom, LindyGroove, The OC Swing Dance Club, Third Street Swingers and Paladino's. And a special thank you to my partner on this event, Debbie Wastling for coordinating the ticket sales as well as making hundreds of fliers and making sure they were distributed. Her helpers were Cathryn Sayer and Carmen Lynne. Pops thanks you from the bottom of his heart and so do I.
Hollywood Hornets were the wonderful Taxi Dancers! 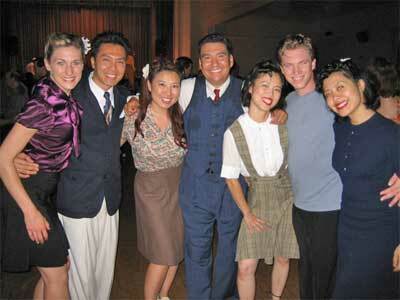 L-R Tunde Hrotko, Quinn Nguyen, Jenny Kim, Giovanni Quintero,Sharlene Choy, Tim O'Neill, and Mae-Lae Louie.